James Furman, called Furman by his family, was born 12 October 1890 in Scuffletown Township, Laurens County1, the fourth child of Thomas Pitts Pool and Jemmie Alexander. Historical Marker- When Furman was born Benjamin Harrison was President, despite losing the popular vote. Major political issues of the day were the Sherman Anti-trust Act, tariffs, and a billion dollar appropriations bill in Congress. The 1890 mid-term elections went poorly for Harrison and the Republicans. The Massacre at Wounded Knee occurred two months later in December, 1890. The Kodak camera was was two years old. After leaving school, Furman was working as a farmer. 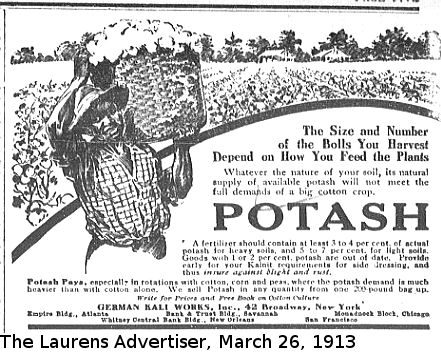 He was keeping up with the latest agricultural information: The Laurens Advertiser of 12 February, 1913 noted that "Messers J. W. Donnan and Furman Poole attended the corn show last week". In 1917, Congress authorized the Selective Draft Act to conscript troops for entry into the Great War raging in Europe. On 5 June 1917, Furman, along with his brother Russell, registered. His brothers Martin and Joshua Craig were registered on 12 September, 1918. The Laurens Advertiser of July 25, 1917 printed the names of all 225 local men drawn on Friday, July 20, 1917 to form the First National Army. Furman was included in the list. However, he was not chosen, and did not serve in the military. 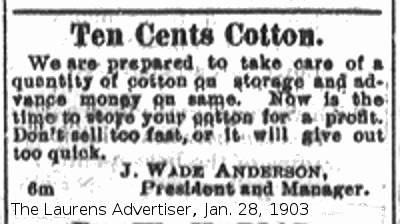 "Cotton", said a tenant farmer, rising awkwardly from the audience, "used to be eight cents when we didn't know what it was to want an automobile, and now that we have paved roads and have to have automobiles and radios and electric lights, cotton is still eight cents." Ben Robertson, Red Hills and Cotton: an Upcountry Memory, University of South Carolina Press, 1942, 1960, p. 162. On January 29, 1934 Furman's brother Joshua Craig was involved in a serious automobile accident. The Greenville News reported that Josh, who was driving two other farmers to a WPA meeting, ran off the road into a gully six miles east of Gray Court, SC. The two passengers were killed, and Josh was hospitalized with a head injury. Josh's wife Sarah Yeargin and brother- in- law were following in another car and witnessed the accident. Mrs. Ruth Poole Mrs. Ruth Martin Poole, 74, of Columbia, died Saturday at a Lexington Nursing Home. 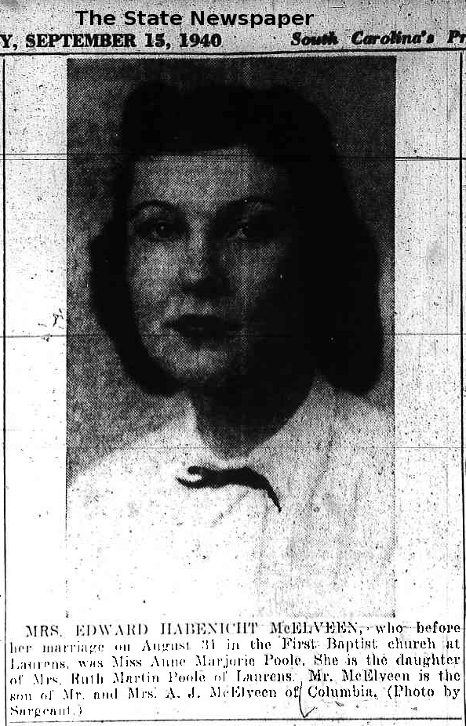 A native and former resident of Laurens, she was the daughter of the late Jasper and Nancy Harris Martin. Surviving are one daughter, Mrs. Marjorie P. McElveen of Columbia, and one sister, Mrs. J. R. Patterson of Lanford. Funeral services will be at 2:30 p.m. Sunday at Kennedy Mortuary Chapel with burial in Laurens City Cemetery. Sometime about 1940, Furman left his family in Laurens, relocating to Sumter, South Carolina, eventually finding employment as a carpenter at the newly built Shaw Field, now Shaw Air Force Base. He never returned to Laurens. His surviving brothers and sisters, with the exception of Martin, had also moved elsewhere. With Martin's death in 1943, the close association of this family with the Warrior and Buckhead Creek area of Laurens County, beginning all those years ago with the arrival of Seth Petty Pool, came to an end. Furman died 7 February 1973 and is buried at Evergreen Cemetery in Sumter.22 As an epilogue to this story of a Laurens County family, I have attached a summary of his life in Sumter, SC. That story brings us to the present time, and the author of these pages. Mrs. Marjorie P. McElveen Mrs. Marjorie Poole McElveen, of Columbia. died Sunday. Born in Laurens, she was a daughter of the late Furman and Ruth Martin Poole. She was a secretary and bookkeeper with Summers Road Machinery Company, a member of the Columbia Chapter of Women in Construction and a member of Ebenezer Lutheran Church. Surviving are a daughter, Mrs. Pascal D. (Anne) Warren of Charleston and grandchildren. Services will be held at 3 p.m. today in Greenlawn Memorial Park, conducted by the Rev. Dr. Robert F. Sims. Pallbearers will be Richard Jackson, Clyde Hall, Larry Cockroff, Chariton Hall Sr., Dr. Carl McElveen, Waldon Graham Frank Lever and Charlton Hall Jr.
Memorials may be made to the Lowman Home, White Rock. Dunbar Funeral Home, Devine Street Chapel is in charge. 1. The 1900 U. S. Federal Census was used to establish date of birth. Furman was inconsistent in reporting his birth year throughout his life. In his earliest records he used 1892. 2. School reports are in The Laurens Advertiser, December 6, 1905, March 21, 1906, May 16, 1906. South Carolina did not have a compulsory school attendance law until 1915. The Laurens Advertiser of 21 April 1915 printed an article on the new law which required attendance between the ages of 8 and 14. Attendance was also required from age 14- 16, with exceptions for children "... actually, regularly and lawfully engaged in some useful employment or service or who cannot read at sight and write legible simple sentences in the English language." 3. The Laurens Advertiser, 3 July, 1912, 17 July, 1912. 4. Automobile trip in the Laurens Advertiser, 28 August 1912. 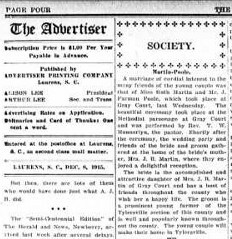 Lawn party in the Laurens Advertiser, 18 September, 1912, Poole- Workman marriage, 11 September, 1912. 5. Obituary, Laurens Advertiser, 4 March 1914; Obituary, Spartanburg Herald Journal, 27 February 1914; Lander College, Catalogue 1905-1906, Lander Roll of Students, Undergraduates, p. 33; Laurens Advertiser, 8 March, 1905. 6. Marriage Register, Laurens Probate Court. 7. RMC (Deeds) Grantor Direct Index to Conveyances 1885-1939, Laurens County Probate Court, Book 39/Page 256. The Laurens Advrtiser of January 7, 1920 reports a real estate transfer of "F. W. Little to J. F. Poole, farm for $12,000.00". The price seems an obvious misprint, and I have not been able to confirm that the "J. F. Poole" mentioned is Furman. Given his situation in the decade of the '20's, I suspect that it is not him. For the tax information, see Laurens County Office: Auditor Auditor's Tax Duplicate Book Townships: Waterloo, Cross Hill, Hunter, Jacks and Scuffletown 1915 C847, at the SC Department of Archives and History. 7a. Laurens County Office: Auditor Auditor's Tax Duplicate Book Townships: Waterloo, Cross Hill, Hunter, Jacks and Scuffletown 1916 C849, and Laurens County Office: Auditor Auditor's Tax Duplicate Book Townships: Waterloo, Cross Hill, Hunter, Jacks and Scuffletown 1918 C854, both at the SC Department of Archives and History. 8. Laurens Advertiser, 3 January 1917. 10. Some references for the history of cotton in the American south are Mule South to Tractor South, George B. Ellenburg, University of Alabama Press, 2007; Cotton Fields no More- Southern Agriculture 1865-1980, Gilbert C. Fite, The University Press of Kentucky, 1984; King Cotton and his Retainers- Financing and Marketing the Cotton Crop of the South, 1800- 1925, Harold D. Woodman, University of South Carolina Press, 1968; Rural Worlds Lost- The American South 1920-1960, Jack Temple Kirby, Louisiana State University Press, 1987. A comparison of the cotton, tobacco and rice agricultures can be found in Breaking the land- The Transformation of Cotton, Tobacco, and Rice Cultures Since 1880, Pete Daniel, University of Illinois Press, 1986. 11. Year: 1920; Census Place: Scuffletown, Laurens, South Carolina; Roll: T625_1700; Page: 4B; Enumeration District: 67; Image: 295. 12. RMC (Deeds) Grantor Direct Index to Conveyances 1885-1939, Laurens Probate Court, Book 45/Page 319. Although this is the officially recorded date, the Laurens Tax Auditor noted on the 1920 report beside Furman's entry- "Land to T. P. Poole"- so it is probable that Furman had effectively ceased farming by 1919 or 1920. See Laurens County Office: Auditor Auditor's Tax Duplicate Book Townships: Waterloo, Cross Hill, Hunter, Jacks and Scuffletown 1920 C860. 13. Birth date unknown; estimated from Census. 16. Marriage, see Richland County Court Records, Marriage Licence 13009 and Laurens Advertiser 2 August 1922. Death, see Richland County SC Death Certificate 13489. An obituary was reprinted without source attribution in A Genealogical History of the Poole, Langston, Mason Families and Kindred Lines of Upper South Carolina by Bessie Poole Lamb and Mary-Mack Poole Ezell, published in 1931. 17. Laurens County Probate, Bundle 517, Pkg. 3. 19. 1930 Federal Census Year: 1930; Census Place: Laurens, Laurens, South Carolina; Roll: 2202; Page: 4A; Enumeration District: 25; Image: 965.0; FHL microfilm: 2341936. 20. Social Security Account Application, 5 December 1936. 21. For occupants, see 1930 Federal Census Year: 1930; Census Place: Laurens, Laurens, South Carolina; Roll: 2202; Page: 4A; Enumeration District: 25; Image: 965.0; FHL microfilm: 2341936. For relationship, see Laurens Advertiser, 22 March 1916. 22. Headstone, Evergreen Cemetery, Sumter, SC.